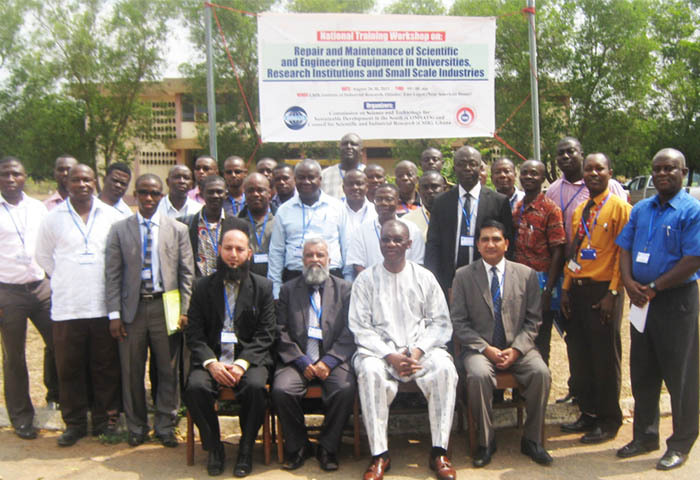 The 7th COMSATS workshop on ‘Repair and Maintenance of Scientific Engineering Equipment in Universities, Research Institutions and Small Scale Industries’ was held from August 26-30, 2013, in Ghana. The five-day event was hosted by COMSATS’ Centre of Excellence in Ghana, Council for Scientific and Industrial Research (CSIR), at one of its research institutes, the Institute of Industrial Research (IIR) in Accra, Ghana. Earlier, the 6th workshop of the series was held in Sudan from August 18-22, 2013. 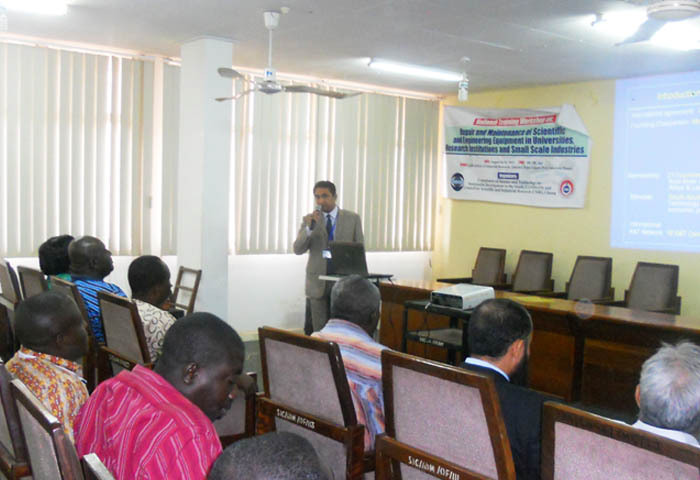 The inaugural ceremony of the workshop was held on August 26, 2013, which was attended by Dr. A. B. Salifu, Director-General CSIR; Mr. Nisar Ahmad, Senior Assistant Director (Systems) COMSATS; Mr. H. A. Obiri, Director IIR; Dr. G. N. Laryea, Acting Deputy-Director IIR; and Mr. E. N. Kotey, Head of Metrology Department, IIR. The ceremony also had a significant participation of senior officials of CSIR and lab technicians belonging to the various institutes of the Council: Building and Road Research Institute (BRRI); Institute of Industrial Research (IIR); Crop Research Institute (CRI); Oil Palm Research Institute (OPRI); Water Research Institute (WRI); Institute of Technological Information (INSTI); Food Research Institute (FRI); Savanna Agri Research Institute (SARI); and Science and Technology Policy Research Institute (STEPRI). The two resource persons for the event, Dr. Muhammed Yaqub and Mr. Arif Karim, from Pakistan and three local resource persons, Mr. Godfried Ampo, Mr. Benjamin S. Addy and Mr. Gabriel A. Mensah, were also present on the occasion. In his welcome remarks, Mr. Obiri informed that the workshop was being held as a follow up of the proposal discussed during the 16th meeting of COMSATS Coordinating Council held at Accra this year. He also introduced IIR to the participants. In his message, read out by Mr. Nisar, Dr. I.E. Qureshi, the Executive Director COMSATS, highlighted the need of developing the capacity relating to repair and maintenance of scientific equipment in research institutions, small-scale industries and universities from developing countries. Dr. Qureshi shared the success of the workshop theme by informing that, so far, more than 240 scientists, engineers, technicians and teachers in COMSATS’ Member Countries have been trained under these events held over the years since 2004. In his speech, Dr. Salifu highlighted the importance of scientific tools in research and stressed the fact that a lot of scientific research activity revolves around measuring instruments and other essential tools, which have to be in prime condition in order to ensure the reliability and the relevance of the results obtained. He noted that Ghana has directly imported many costly instruments worth about twenty-five million dollars from all parts of the world during January 2000 and December 2012, and emphasized the need to develop indigenous skills and capabilities to independently maintain the costly equipment. Dr. Salifu expressed his gratitude to COMSATS for accepting the request of the CSIR to jointly organize this workshop in Ghana and for providing financial and logistical support. 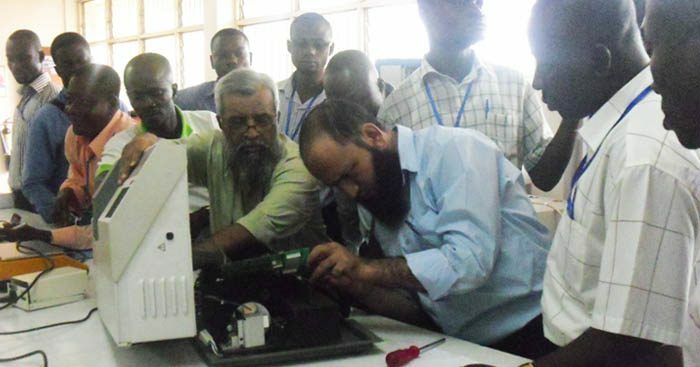 During the 18 technical sessions of the workshop, the experts imparted training on various topics including: Spectrophotometer Systems; Flame Photometer Systems; Centrifuge Systems; Laboratory Glassware; Balances; Thermal Equipment; pH Meters & Colorimeter; Microscopes; and Laboratory Planning and Management. The sessions comprised hands-on training complemented by lectures on the theme of the workshop. To consolidate the trainees’ learning, the participants were also provided the opportunity to work on the faulty equipment under the supervision of the experts to practice their knowledge acquired during the technical sessions. The closing ceremony of the workshop was held on August 30, 2013. Dr. Yahuza Mohammed Gomda, Director Science, Technology and Innovation of the Ministry of Environment, Science, Technology and Innovation, Government of Ghana, graced the occasion as the chief guest. In his remarks, Dr. Gomda commended COMSATS for organizing the much needed national workshop in Ghana and hoped that it resulted in information-exchange among scientists, researchers, technicians, service engineers, and industrialists for enhancing the existing scientific capacity. Speaking on the occasion, Dr. Salifu also expressed his gratitude to COMSATS and showed his satisfaction over the successful holding of the workshop. He particularly praised the visiting experts for their hard work and knowledge imparted to the participants. 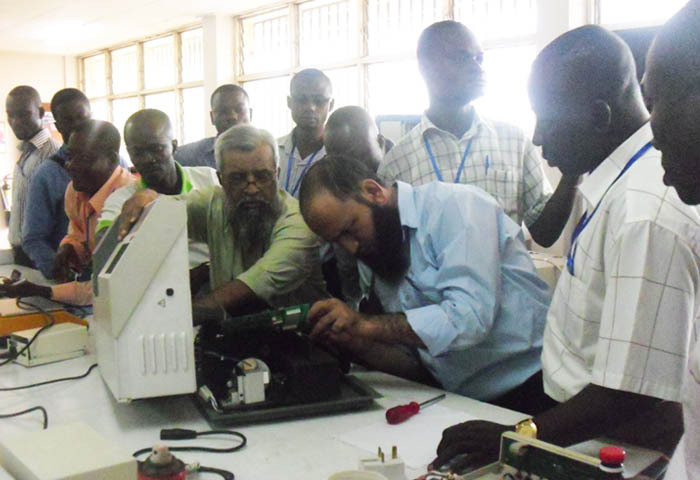 Dr. Salifu appreciated the extra work hours of the experts and participants in labs to repair the faulty equipment. The certificates were distributed among trainees, organizers and experts. The workshop resulted in training more than thirty (30) participants, including engineers, researchers and students of various institutions from Ghana.